Dorset and Somerset Air Ambulance is delighted to announce that its new AgustaWestland 169 (AW169) helicopter entered into service yesterday. This becomes the first AW169 to enter air ambulance operational service in the UK and is the culmination of years of planning and development. The aircraft was selected following an extensive evaluation process. Its outstanding characteristics, superior capabilities and safety standards will ensure unprecedented levels of mission effectiveness and provide an enhanced life-saving service for the people of Dorset and Somerset. Bill Sivewright, Dorset and Somerset Air Ambulance Chief Executive Officer, said: “It has always been the Charity’s aim and clear vision to pursue clinical excellence; pairing Critical Care Teams with the outstanding capabilities of the AW169 s is a natural development of that vision. Patient benefit remains our top priority and this was the single biggest criteria in selecting the new aircraft. “Our ambitions and clinical aspirations determined a particular requirement from whichever aircraft we selected. The capabilities and flexibility offered by the AW169 made it a clear winner and in our view it was the only aircraft which fully met our criteria. Another major plus in selecting a new mark of aircraft is that you are taking advantage of the latest advances in technology. That means that it is safer and easier to maintain and operate. 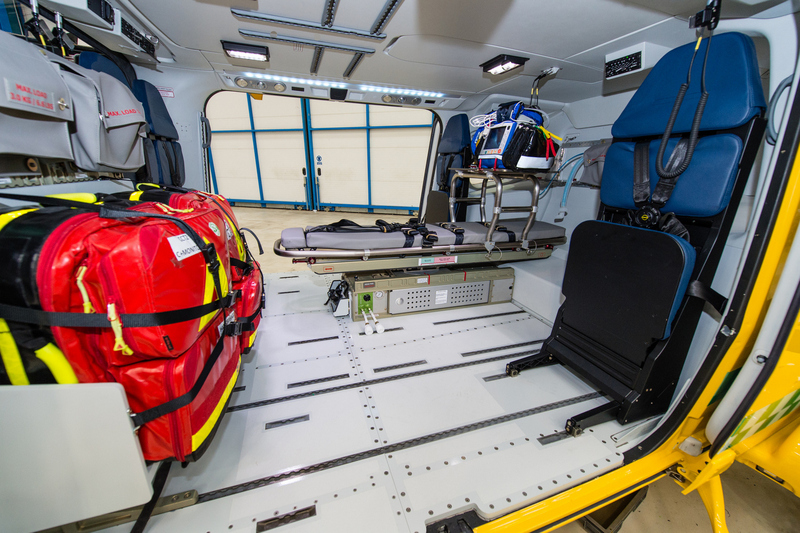 The medical equipment in the AW169 will not be hugely different to that which was carried on the Charity’s previous aircraft. However, the biggest difference is the space inside the cabin. This allows the Critical Care Team to have complete access to a patient, head to toe; a significant benefit if a patient needs further intervention or treatment on-route to hospital. Over the past few months, the life-saving service has increased its operating hours from 12 to 19 hours a day (7am-2am). During this time and in the hours of darkness, the crews have been deployed using a Critical Care Car. Bill continues: “We are most grateful to Specialist Aviation Services who operate the AW169 helicopter on our behalf. They have worked closely with our clinical team to develop a medical interior that will enable them to more fully meet the needs of our patients than ever before. “The AW169’s night-flying capabilities mean that we can now move forward into providing full night HEMS (Helicopter Emergency Medical Service) missions. Our team will have the ability to fly directly to the patient without the need of any fixed or pre-established lighting which is a significant advantage. We are now looking forward to completing night HEMS training and subsequently operating the new aircraft for 19 hours a day. More information on Dorset and Somerset Air Ambulance can be found by visiting: www.dsairambulance.org.uk or by calling: 01823 669604.